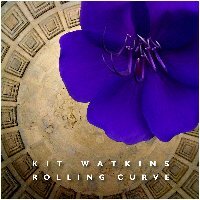 We could not be prouder to announce the Earth Mantra release of Rolling Curve by none other than ambient grand master Kit Watkins. This is a collection of immersive and profound ambient music, equally suitable for restful listening or deep drift meditation, with guest artists Steve Roach and Brad Allen. It was described by Chuck van Zyl as seeping "... into your room, through the keyhole and around the door jam, like smoke from a smoldering concept or mist from a descending idea". Further, Jim Brenholts said: "Kit’s soundworlds conjure images of clouds and threats of doom and disaster. They are only threats. While the dark overtones are predominant, the melody creates an undercurrent of light and hope." Our take is that this is one of the finest pure ambient albums ever released, and any lover of ambient music simply must add this extraordinary release to their collection. We are simply ecstatic to be bringing you the music of Kit Watkins via Earth Mantra, and look forward to bringing you more music by this world-reknowned artist in the future.